The facade of the John William Roberts House situated on historic property in Woody Point in Gros Morne National Park in Newfoundland, Canada. The John William Roberts House in Woody Point in Gros Morne National Park in Newfoundland, Canada has been declared as a heritage structure, including the property around it. 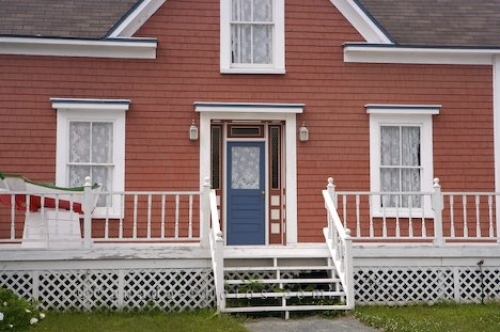 This house was built in 1898 and is typical of the style of house constructed by the early settlers to the area of Woody Point and it is on waterfront property. The Roberts family were included amongst the people who were the first settlers to Woody Point and in this house, three generations of the Roberts family resided. Today, visitors can enter the house which is used as an information center. John William Roberts House Historic Property, circa 1900, Woody Point, Gros Morne National Park, UNESCO World Heritage Site, Viking Trail, Trails to the Vikings, Highway 431, Northern Peninsula, Great Northern Peninsula, Newfoundland Labrador, Newfoundland, Canada. Picture of the entranceway to the John William Roberts House and the historic property it sits on in Newfoundland, Canada.